Cindy is a zoologist and the Education Curator at The Whale Museum in Friday Harbor on San Juan Island. For more than 34 years, the museum’s mission is Promoting stewardship of whales and the Salish Sea ecosystem through education and research. The museum is home to two gray whale skeletons: one hangs from the ceiling, and the other can be put together like a giant puzzle on the floor. Last year, the museum’s gray whale project was in need of a new display when Cindy happened upon Eberhard Eichner and the REvision Division booth at the Green Village during the San Juan County Fair. Eberhard, The RE Store’s designer/builder, launched the REvision Division two years ago, taking orders for custom building projects using recycled materials for businesses, home owners, and organizations. 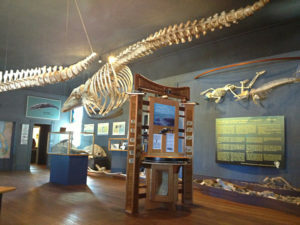 The Whale Museum received a grant for the gray whale exhibit, and they commissioned Eberhard and the REvision Division to design, build, and help install the interactive/interpretative information station. Cindy, Jenny (the museum’s Executive Director), and Jill (Communications Manager) met with Eberhard in Bellingham to discuss the project, and, “As the four of us were talking, it all fell together.” Cindy said they had envisioned something with several panels on it, but it was Eberhard’s idea to work with the materials that he used: a door and a table at the center of the design, and louver doors as a decorative touch. “We decided to use those to display trivia cards, which are a huge hit,” she said. “The top “whale’s tail” panel came from a bed headboard and is floating on and among stacked “low tide rocks”, a.k.a. 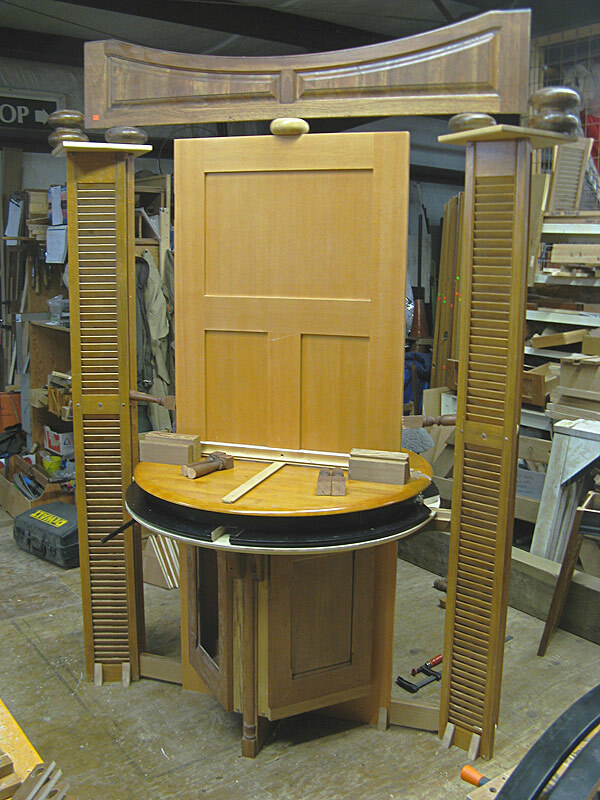 furniture legs. “Eberhard was great to work with. He was so great at listening to our thoughts and suggestions,” said Cindy. You can see the whale skeleton and the custom display at The Whale Museum, of course, and also on its website. The REvision Division has built, among other things, a puppet theater for the Lummi Island Library, custom furniture for an elderly retirement house, and a picnic table for a dog park. In Seattle on the third Saturday of the month from 11:00 a.m. to 2:00 p.m.
And you can find The RE Store educational DIY videos on the REvision Division page.